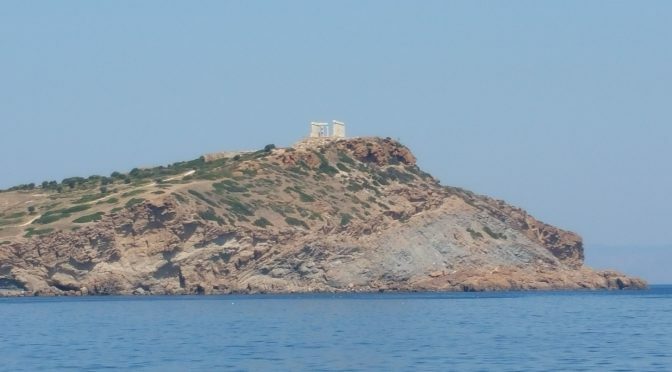 This is a large bay, about 500 m across to the west of Ak Sounion offering shelder from the Meltemi. It comprises three smaller coves to the north west, north east and east. The NW and NE bays are separated by a rocky headland at the north point of the bay. The NW cove is buoyed off behind a small breakwater to protect swimmers off the public beach below the large Grechotel complex. There is a mini market just outside the Grechotel gate on the north side of the road opposite the car park. There are small beaches to the west and east of the North Headland where a tender can land and be left safely. The entrance to the west beach is through a narrow gap between the rocks and the headland, it is shallow and can be crowded with swimmers. The eastern cove is buoyed off to protect the beach for the Agean Beach Hotel. The seabed is primarily sand and weed and there are depths of 5 metres within 50 to 100 metres of the coastline. The Pilot Book (Greek Waters Pilot – Heikell R&L) suggest the holding here is bad. We anchored just west of the North Headland and did drag in a 30 knot Meltami but re-anchored successfully using more chain, between 5 and 6 times the depth of water. On 3 successive occasions we anchored in the NE bay and rode out similar winds without incident. The bay gets crowded overnight on the weekends but is relatively empty during the day and almost deserted during the week. There is a swell that runs in most evenings which can be uncomfortable when the wind dies down. The ruins of the Temple of Poseidon are accessible via cab and are worth a visit but you can see virtually all there is from the anchorage, just in more detail. Overall a fairly quiet, pleasant anchorage.